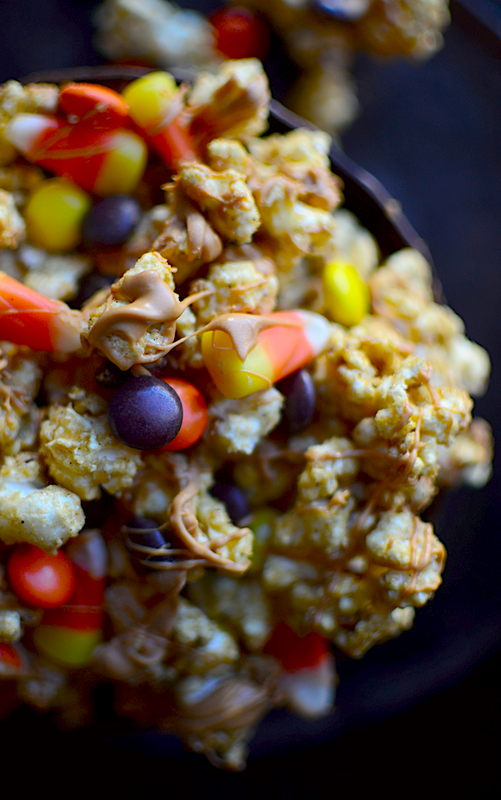 So tell me, does the candy corn scattered in this beautiful, crunchy mess make you gag or did your mouth start watering for it as soon as you flipped the calendar to October? I know there are strong feelings about candy corn. I wasn't sure what mine were though. I thought that maybe, being pregnant and all, I might eat the entire bag in one sitting (I mean, my mouth started inexplicably watering when I saw this video for Pickle Cupcakes on Facebook yesterday, so I really have no idea what weird things this baby will make me do). 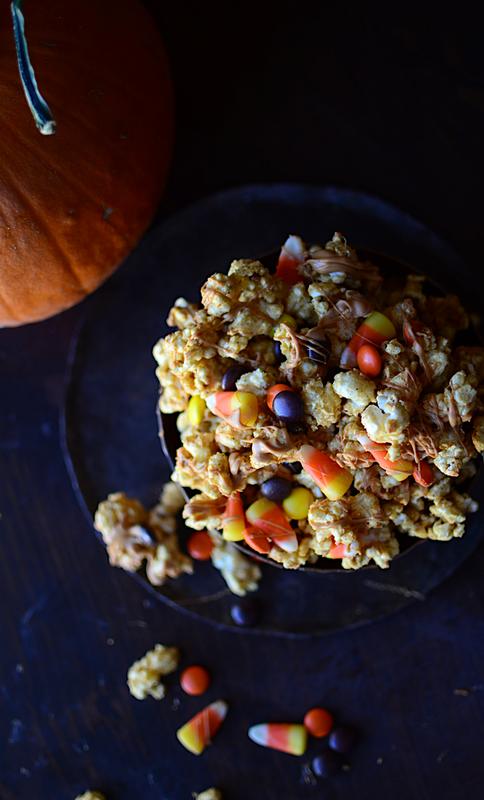 But no, I still did find myself picking around the candy corn while munching on a huge bowl of this caramel corn. I felt somewhat embarrassed that I even added it to the caramel corn (even though it's SO CUTE) because I thought Samuel would think I was crazy. Well, when he got home last night, he saw the jars of candy corn I set out for decoration (seriously, I only know how to decorate with food). "Did you buy candy corn?!?" "Um... yes. Well, you see... I was making this post. And... well, I just think it's cute! I mean-"
"At least I did when I was a kid," he continued, "I would eat it by the gallon. The highlight of Halloween. I don't know if I still would feel the same though, actually." Well, he still hasn't tried it. Maybe he's worried that he'll ruin his fondest memories of gorging himself on it as a child if he does. 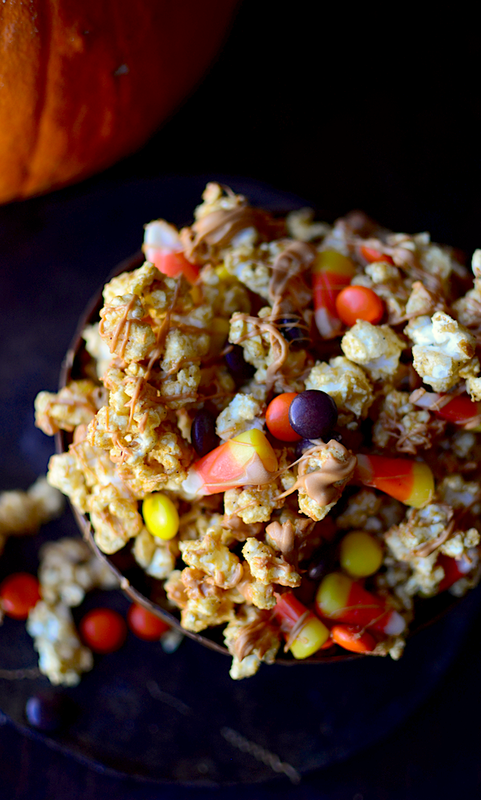 So I have to be honest about this, I actually preferred the caramel corn that I left without candy. The pumpkin spice is just SO GOOD in it, it doesn't need anything else. Next time I might just add some Halloween sprinkles. I mean, don't get me wrong, I love chomping down on a handful and discovering a big glob of Reese's pieces, but it really doesn't need it if you don't want to add it. Now, most people may be timid of making caramel corn, but that's because they haven't tried my Grandma's famously easy and delicious microwave caramel corn. 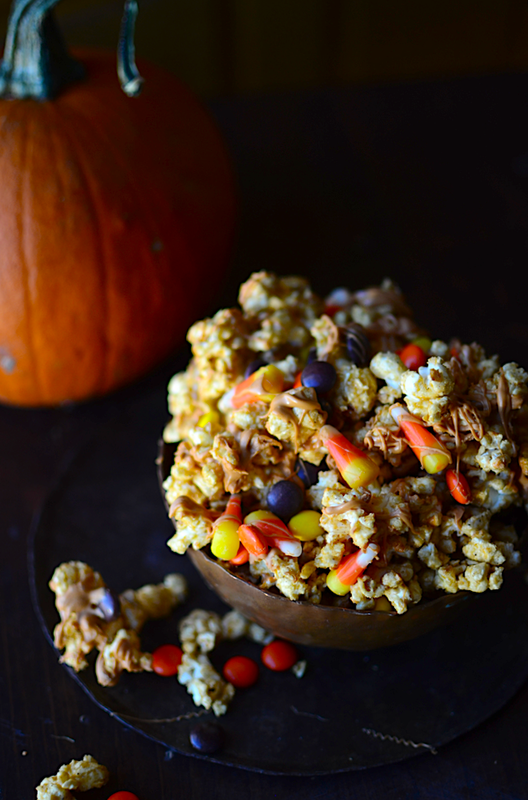 I have always thought of caramel corn as one of the easiest things you can possibly make because of this recipe. I love it with the pumpkin spice, even more than I thought I would. It made my house smell like heaven and a bowl sitting on the table instantly makes you want to break into that Michael Jackson zombie dance. 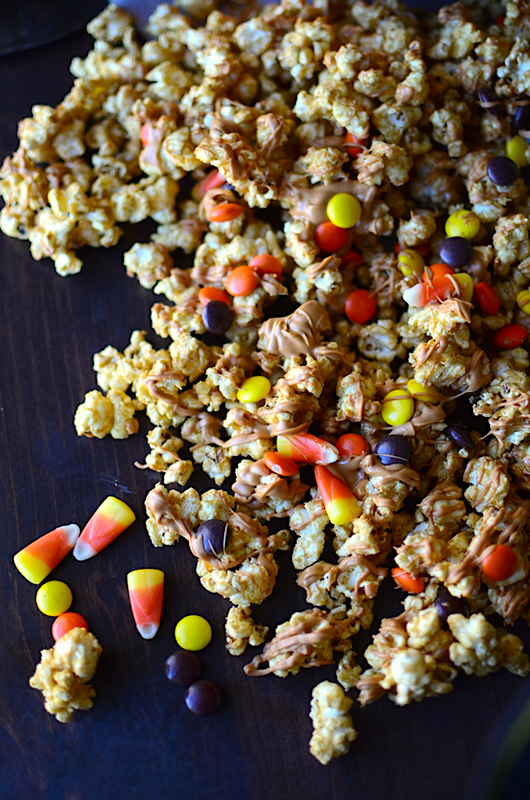 Make it for your Halloween party or for your solo midnight munchings. The choice is up to you. Pop the microwave popcorn and put them in a brown paper grocery bag. You can cut about six inches off the top of the bag so it will be easier to reach in and stir later on. Slice up the butter. Combine the butter, syrup, and sugar in a 4 cup glass measuring cup (another microwave safe bowl would also work). Microwave 5 minutes, stirring well every thirty seconds. Add the vanilla, soda, and spices and stir well until it's foamy. 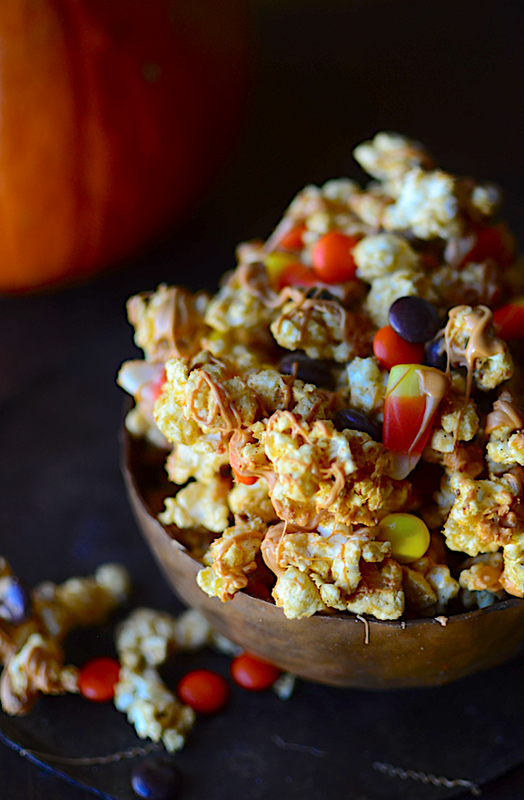 Pour the caramel over the popcorn in the bag. Stir it well. You don't want to have any clumps of caramel or they will burn. Roll up the top of the grocery bag and microwave 3 minutes stirring very well every thirty seconds. Pour out onto a large greased piece of foil or parchment paper. Sprinkle on any desired add-ins and melt the chocolate and drizzle it on. Allow the chocolate to harden before serving.